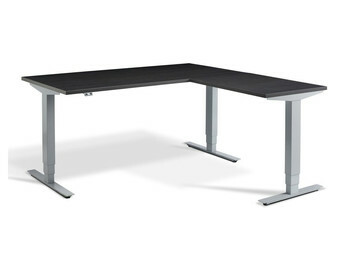 Height adjustable desks or sit-stand desks can be manually or electronically adjusted to sitting or standing positions, they are designed to enable the user to sit and stand in order to prevent problems associated with sitting for prolonged periods of time. Sitting for long periods every day burns very few calories and studies have linked this to weight gain and obesity. This can lead to an increased risk of diabetes and heart disease with the ‘Sitting is the new smoking’ claim appearing in many recent publications and articles. Although height adjustable desks alone cannot tackle or alleviate these problems it is better for people to have the option to sit or stand as this option encourages movement, which helps and improves blood circulation, alertness, concentration, and productivity. It can also be said if we stand more at work we potentially prevent muscular aches and other back problems which are associated with being static throughout the day. 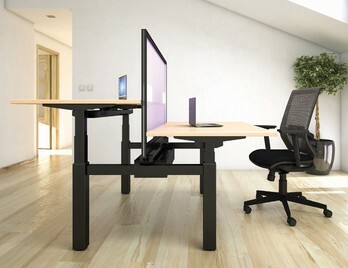 Ergo Step is an electric height adjustable desk designed to look after your health while you work. The overall minimalistic design has the user in mind with soft-touch buttons and twin motors for smooth and quiet elevations. 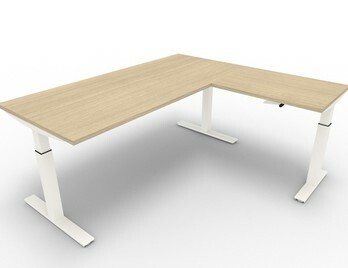 These and additional features generate stimulating work environments that promote creativity and individual well-being. 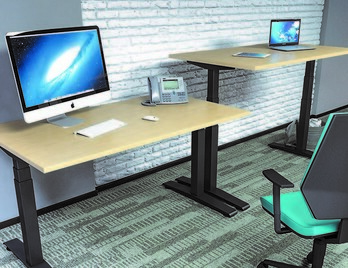 The Ergo Step desk system is certainly a step in the right direction within the furniture industry, upwards. The Avalon Lite Sit-Stand Desk is a stylish sit-stand solution, with a sensitive pricing structure that won't leave you needing to sit down! The smooth elevation is powered by soft touch buttons which control the actuators that provide height adjustment of 710mm - 1210mm. 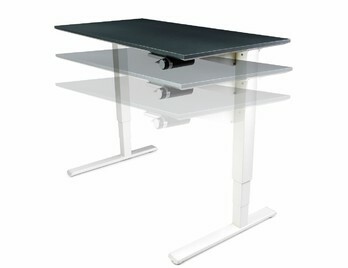 The desktop is 25mm thick MFC with a choice of 15 finishes and a stylish steel frame in silver or white. Free delivery and installation to mainland UK. 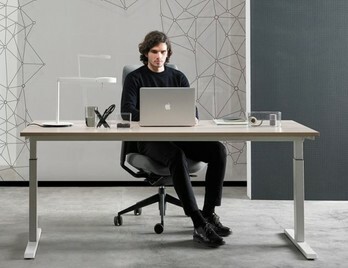 Float is a revolutionary standing office desk that brings the effortless operation to traditional sit-stand products. Ease of use is at the heart of Float, as it seamlessly adjusts between sitting and standing postures without interrupting workflow. With a gentle push up of the paddle lever, using a patented counterbalance mechanism, the desktop lifts up and down silently with ease. With a minimal aesthetic, Float complements traditional offices and home workspaces. The Avalon Plus Twin Sit-Stand Desk is a stylish sit-stand solution. The system is designed with a complete configuration in mind as can cater to individual users or banks of users. 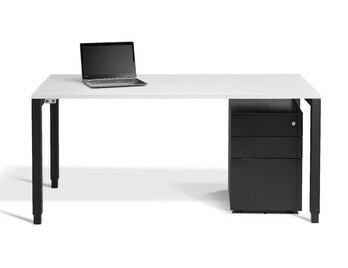 The Twin desk comes with dividing screen options in fabric or coloured acrylic. The smooth elevation is powered by soft touch buttons which control the actuators that provide height adjustment of 710mm - 1210mm. 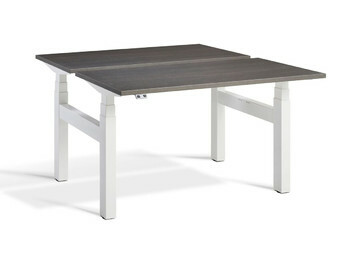 The desktop is 25mm thick MFC with a choice of 15 finishes and a stylish steel frame in silver or white. 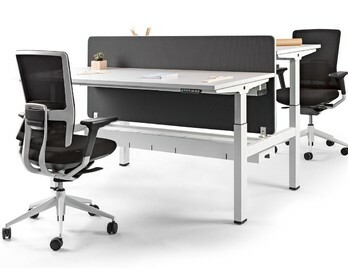 The new Aevig Duo height adjustable desking allows two people to work on a contemporary bench system, with the option and facility to stand up at work any time. The Duo frame is powered by four high quality motors, so each side can be used independently, with soft-touch control for each. The Aevig desk has advanced anti-collision software as standard, stopping and intelligently rising 100mm to allow you to remove the object in its path. The Aevig Dual Motor Bench Desk is a high-quality dual motor height electric sit/stand desk manufactured in Europe from top-grade steel. Available in two frame colours and eight top finishes, this desk will fit into any office environment from 1200mm wide (ideal for hot desking, agile working and telesales role) to 1800mm wide (perfect for executives and managers). The Aevig desks has advanced anti-collision software as standard, stopping and intelligently rising 100mm to allow you to remove the object in its path. The Aevig Desk comes with a free no quibble 5 year manufactures guarantee it is a top quality world class height adjustable (sit/stand) desk. The Aevig Dual Motor Desk is a high-quality dual motor height electric sit/stand desk manufactured in Europe from top-grade steel. Available in two frame colours and eight top finishes, this desk will fit into any office environment from 1200mm wide (ideal for hot desking, agile working and telesales role) to 1800mm wide (perfect for executives and managers). The Aevig desk has advanced anti-collision software as standard, stopping and intelligently rising 100mm to allow you to remove the object in its path. Sitting in front of a desk all day isn’t always comfortable, or healthy. The Aevig height adjustable corner desk gives you the choice to either stand or sit at your desk which can help with improving health. The top finish is made from 25mm thick MFC top that comes in a choice of nine finishes, and a choice of either a white or silver steel frame. 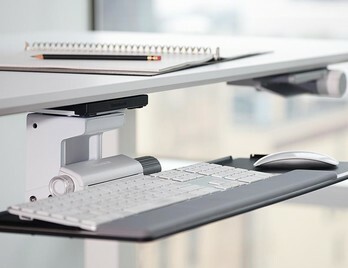 The soft touch controller makes it easy to adjust the desk’s height. The Avalon Plus Sit-Stand Desk is a stylish sit-stand solution, which compared to the 2 stage Lite version has a 3 stage telescopic heavy duty leg for extra height and added stability. The smooth elevation is powered by soft touch buttons which control the actuators that provide height adjustment of 710mm - 1210mm. 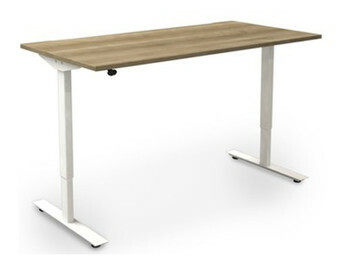 The desktop is 25mm thick MFC with a choice of 15 finishes and a stylish steel frame in silver or white. Free delivery and installation to mainland UK. A key component for a well designed ergonomic workstation is the keyboard support system as this will prevent users from reaching and hunching over, offering protection from neck and back pain and other musculoskeletal issues. When you can bring the keyboard and mouse to the user with this system it allows the user to adopt a healthy and neutral posture. 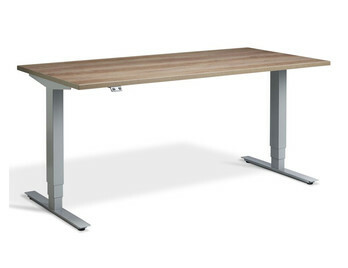 Our stylish Novara Manual Height Adjustable Corner Desk features plenty of desk space and storage space below. Add one of our optional desktop cable access ports to further organise and keep your cables tidy. Horizontal cable tray and vertical cable spine included. Manual front-facing hand crank allows you to adjust the desk height from 650mm to 1300mm - perfect for helping to improve posture and overall wellbeing. Did you know that in Sweden, Norway, and Finland, over 80% of office workers use sit-stand desks, and in Denmark height, adjustable or sit-stand desks are now mandatory? This is due to legislation that was passed, giving guidance to employers that office workers should have the right to reduce sitting time whilst at work. Health risks such as heart disease, diabetes, and back pain can be caused by a sedentary lifestyle, so we should now be looking at sit stand desks as an investment as opposed to a cost? Surely if workers in the UK, like in Sweden, had access to a height adjustable desks, we would see a healthier more productive workforce? That surely is the best investment any company could make? Inspired by a visit to Gothenburg, Sweden in 2013 and the healthy working practices the Scandinavians employ Gavin Bradley decided that other countries needed simple (but stern) communication from the fast emerging area of sedentary science. In short, we have dropped the ball and need to become more acutely aware of just how dangerous and widespread the health risks of prolonged sitting can be – irrespective of the levels of physical activity. This is why the campaign ‘Get Britain Standing’ was born. Their goal is to draw attention to the significant increase in health risks caused by sitting and compelling benefits of converting sitting time to standing time whilst at work (wellbeing, productivity, and positive attitude). We have seen many government campaigns on tackling obesity and sugary foods but have not tackled our often sedentary work habits head-on. Today ‘sitting time’ is rarely mentioned in the media so the Get Britain Standing campaign is definitely worth getting behind, and standing up for! The following benefits have been supported by science research facilities. 1. Standing lowers your risk of weight gain and obesity. Exercise is the most effective way effective way to burn calories quickly and simply choosing to stand instead of sitting can also be beneficial. When compared to an afternoon of sedentary work, an equal amount of time spent standing has been shown to burn over 170 additional calories which are almost 1000 extra calories a week. Standing desks, it would appear, have a positive influence on overall wellbeing. Sitting for long periods of time has had direct links to mental health, depression, and anxiety. A recent study has shown that participants using a stand-up desk generally have more energy and are in a better mood. When sit-stand desks were first introduced to the market, there was a concern that stand up desks would hinder normal office tasks such as typing. But a study showed that during a 4 hour period using a standing desk, no typing errors or words per minute had been affected by standing. Here at Office Reality, we have seen sales of height adjustable desks increase steadily over the past year as we have always promoted the benefits of standing at work. We offer a few different versions and variations of height adjustable desks such as manual, which adjust s the height of the worktop with a crank handle or an electric version which simply adjusts your desk height at the touch of a button. The manual or crank handle desk will allow you to stand or sit without having to spend too much on an electrical version, which is of course due to the components going to be more expensive. However, with the demand, and technological improvements electrical height adjustable desks are becoming less costly to manufacture than a few years ago. The Humanscale Float Desk is unique in comparison to other mechanisms as it operates on a non-electrical counter balance system. With a gentle lift of the paddle, underneath the desktop, the desktop raises or lowers with ease. We also offer alternative products such as desk risers and if on a tight budget we can supply height adjustable frame only, leaving you to source your own desktop or even reuse your existing one?